Our preserve hog hunts are our most popular boar hunts. These hunts are guaranteed shot opportunity hunts (see Our Guarantee). Our success rate on the 2 day hunt over the past 8 years has been approx 98%. We offer these hunts year round. 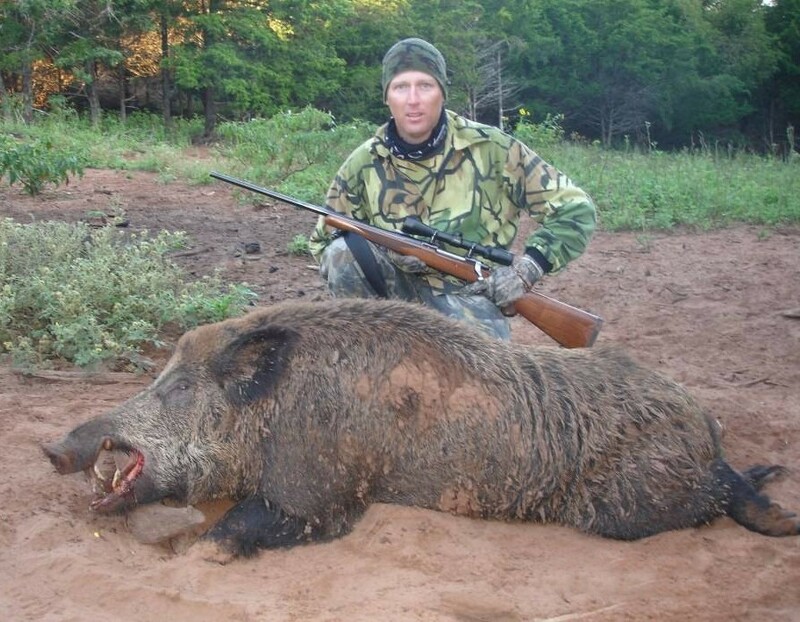 We offer hunts for two types of wild hogs: Pure Russian and Feral Wild Hogs. Pure Russian Trophy Boar Hunts are a new addition to our ranch. While our normal high fenced boar hunts offer opportunity at hogs with strong Russian genetics they are not pure Russian hogs. However, we are pleased to now offer 100% pure Russian Boar hunts from our exclusive pure stock. Many ranches advertise pure Russian or Eurasian boar hunts but many of those are simply feral hogs which have strong Russian traits. What we are offering is 100% pure stock for true Trophy Boars. This exclusive hunt is offered from November through December for a very limited amount of hunts so book this hunt early. The Pure Russian Boar hunts include at Trophy Boar weighing 250 to 300 pounds or more with tusks! Below is an example of a Pure Russian Boar killed on our ranch. These hog hunts take place on approximately 300 acres of dense timber, canyons, and hills. We offer these boar hunts with basically any weapon: gun, bow, cross-bow, muzzleloader, etc… We hunt over bait on stands as well as stalking. Come and find out what makes wild boar hunting so exciting and challenging. Wild hogs have a keen sense of smell and are very intelligent animal. This makes for a challenging hunt. Wild boar are known for their toughness. We’ve had many hunters that have hunted wild game all over the world which have been amazed by the wild boar’s ability to be shot and still run several hundred yards. The Wild Hogs killed on our standard hog hunt typically range in size from 100 lbs. to over 300+ lbs. There are NO TROPHY fees on any of our hog hunts. We have introduced pure russian wild boars into this hunting area. Many of the boars killed in this hunting area therefore have the distinctive russian boar characteristics. These characteristics are a long snout, large front shoulders with a smaller rear, and long bristles of hair running from the head down the back. Russian boars are particularly know for their fiery temperament, which is how they have become known as the poor man’s grizzly. We can hunt a maximum of 18 people on our high fenced hunt. We offer these hunts 7 days a week and book dates based on what works best for you. We require a minimum of 2 hunters to book these hunts with lodging (The Pure Russian Boar hunts can be booked with a single hunter). However, we can book single hunters on dates when other groups will be hunting. If you have a party of 8 or more you will have a hunting area to yourself. If your party is smaller than 8 there may be other hunters in your hunting area at the time of your hunt, but they won’t actually hunt with you. If you would like to reserve the entire hunting area we can arrange that for additional fees. High fenced hog hunting will require a $25 state license fee which can be obtained by following this link: Oklahoma Feral Swine License. All hog hunters are required to purchase a $20 Oklahoma Feral Swine Control Association membership to hog hunt at our ranch. This organization promotes the control of feral swine in Oklahoma through sport hunting and protects our rights to hunt. This Association Fee must be purchased online at OFSCA. Like No Mercy® Hunting on Facebook for the latest kill pictures, hunting tips, special offers and random bits of knowledge. Copyright ©2018 | No Mercy® Hunting Services, LLC.. 26196 CS 2640 Gracemont, OK 73042 | 580-515-4533 | All rights reserved.